Do you want to be part of our expanding Client base? As part of our air conditioning repair service we efficiently deal with refrigerant gases, repair and replace burst or damaged coils and filters, have emergency call outs available, and even supply you with a mobile heating system if your boiler breaks down. Our experienced team will cover all bases to ensure a safe and effective repair is guaranteed. Find out more by visiting our website. We supply air conditioning units which are designed to deliver top performance and durability, and also come with a full guarantee. This means that our highly mobile team are on hand every day of the year to service and maintain your units if necessary, included in your product package. No servicing job is too big or too small for our engineering experts, as we always aim to provide excellent value for money long after purchase and installation. Find out more by visiting our website. At Climate Environmental we are one of the best air conditioning companies in the country. We have pulled ahead of our competition because our comprehensive service includes planning, installation and maintenance. Because we understand that every customer is different, we work hard alongside our clients to ensure they receive the best service possible. Find out more by visiting our website. At Climate Environmental, we are dedicated to delivering a complete service regardless of the original order. Our air conditioning maintenance service is available any time after installation both domestically and corporately and our team of specialist engineers will fully check over and service your product. Find out more by visiting our website. At Climate Environmental we have many years of experience within the air conditioning industry and we have become one of the best companies within the business. Our comprehensive service has put us ahead of the competition because we offer our services around your specification and our free on-site survey helps us choose the most cost efficient choice for you. To find out more about our service please visit our website or call us on 01252 851 114. Are you interested in air conditioning for your home or business? Based in Surrey, we supply specialist air conditioning systems for homes and businesses. We will also take care of all aspects of the installation and service, from design to maintenance. To find out more about our service please visit our website or call us on 01252 851 114. At Climate Environmental, we understand the importance of having a balanced climate in any domestic or work environment. It is essential that your air conditioning unit is fully functioning to allow for a more comfortable environment. The air conditioning servicing work that we carry out complies with HVCA regulation TR17/19 and it involves removing, cleaning and replacing filters. For further information, visit us online. If you are interested in installing an air conditioning system in your home or business or you have an existing system which needs servicing, then we may be able to help. With over 40 years’ experience within the industry, we are leading specialists in air conditioning and our comprehensive service ensures that you are fully covered. To find out more about our air conditioning in Hampshire please visit our website or give us a call on 01252 851 114. Here at Climate Environmental Ltd we commit to delivering a high quality, reliable service from design through to product after-care. Accordingly, we ensure that our highly skilled, F-Gas registered engineers provide servicing and expert advice that is adapted to your needs. We understand the importance of having a balanced climate in any domestic or work environment. Having a fully-functional, safe and clean air conditioning unit allows comfort and better work performance. No servicing job is too big or too small for our engineering experts, as we always aim to provide excellent value for money long after purchase and installation. If you would like to find out more about our air conditioning maintenance then please visit our website or give us a call on 01252 851 114. At Climate Environmental we are one of the best air conditioning companies in the UK. We have years of experience and knowledge within the industry and we can provide air conditioning installation, maintenance, servicing and more. We provide systems from leading manufacturers such as Daikin, Mitsubishi electric, Toshiba and much more. Visit our website for further information. If you require air conditioning in Hampshire then please give us a call today on 01252 851 114 or visit our website. 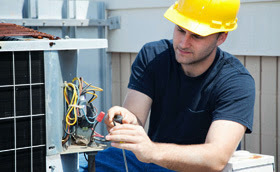 Air Conditioning Maintenance – Why Is It Important? If you have your air conditioning system regularly serviced and maintained then this can help in the prevention of a break down. This is important because if your system breaks down then you may have to pay a lot more money to get it repaired again. At Climate Environmental we provide a high quality air conditioning maintenance service to ensure that you can always rely on your system. Visit us online to find out more. If you have your air conditioning system regularly serviced and maintained then this can help to stop it from breaking down. This is important because if your system was to break down then you would have to pay much more money to get it repaired again. At Climate Environmental we provide a high quality air conditioning maintenance service to ensure that you can always rely on your system. Visit us online to find out more. If you are looking for a company who can provide you with quality air conditioning in Hampshire, look no further. Here at Climate Environmental we have over 40 years of experience in the air conditioning industry and we are able to take care of all aspects of air conditioning and ventilation. If you would like more information on the services we offer, visit our website or give us a call on 01252 851 114.